The AIDS Walk Houston fundraising incentives are here! There are three fundraising levels: $125, $500, $1,000. Here is how it works. Raise $125 and receive a t-shirt. Raise $500 and get the t-shirt and a pair of rockin' socks. Raise $1,000 and you will be decked out with the t-shirt, the socks, and high-tech thermal tumbler to keep your drink chill on those broiling summer afternoons! PLEASE NOTE: Incentives are based on individual fundraising totals, NOT team fundraising totals. You will be able to pick up your incentives on the day of the walk at the "Incentives" tent. Good luck and happy fundraising! Please Note: Incentives are NOT available for purchase. You get this awesome t-shirt sporting the AIDS Walk Houston logo! 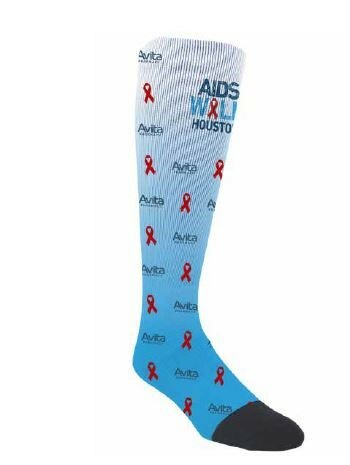 You get the t-shirt plus this a rocking pair of AIDS Walk Houston socks! You get the t-shirt, the socks, and a high-tech thermal tumbler with the Walk logo!